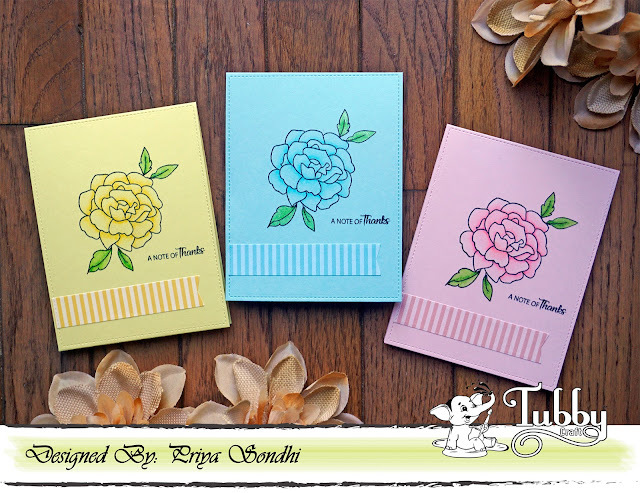 Four Money Wraps + New Inks! Tubby Craft is very happy to add two new ink colours to their existing ink line of 10 colours - Lawn Green and Aqua Blue. We are super delighted to introduce new colours with Hussena today. She has used new inks with existing range of colours for water colouring, stamping and blending in her post. Her gorgeous creations have truly done justice to our products. We can't thank you enough to join us for this month and product launch. 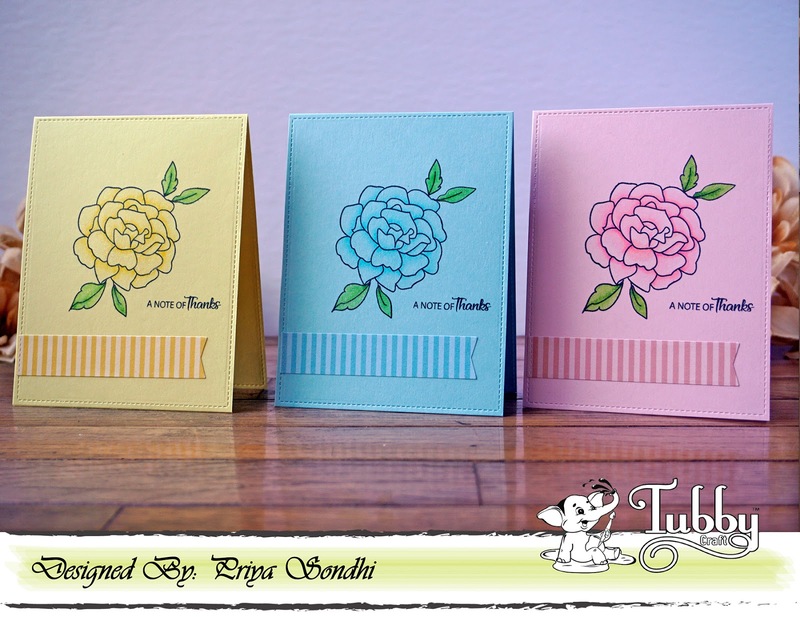 Today, for my last guest post, I am sharing four envelopes I made using different stamp sets from Tubby Craft. 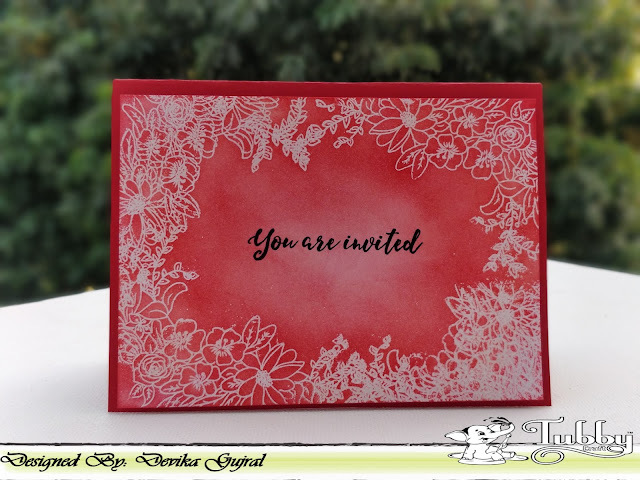 I shared a card last time and thought it would be nice to work on money/shagun envelopes for my guest design post again. I really enjoyed making them, and hope you will like the idea too. I will share each envelope and the close-up pictures one by one. I made all these envelopes primarily using two sets - Buttercup and Floral Peony. These sets have some beautiful floral images in them, and as you know, I am a big sucker for all things florals! I was pretty excited to work with these two sets for my post. Let's start with the first one! I made this envelope using the Floral Peony and Buttercup sets. 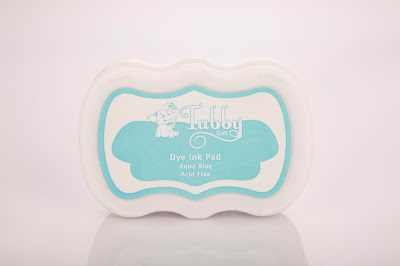 I also used the newly launched Tubby Craft Aqua Blue and Lawn Green inks to watercolor my images. The inks are very intense, and hence give a very vivid and bright color when coloring. I really loved working with them. I colored the small filler flowers from the Buttercup set using Imperial Red ink. 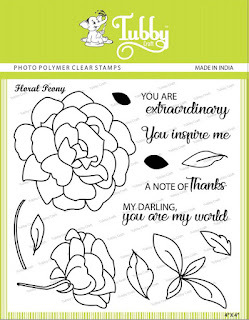 The sentiment stamp is also from the Floral Peony set. I also used the Light Pink ink to distress the oval frame and the sentiment banner to tie in everything together. 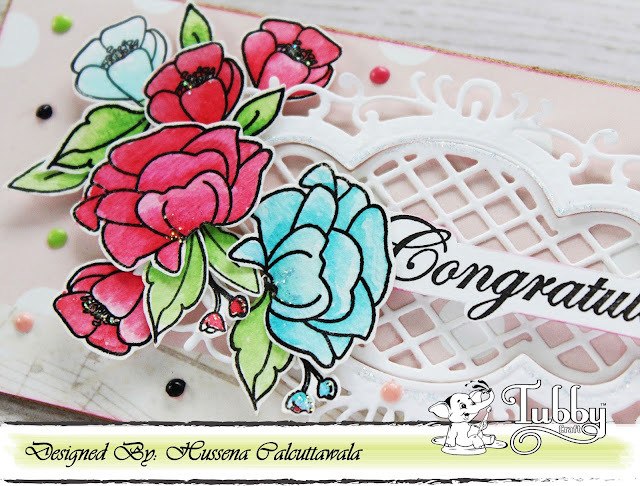 I added Diamond Stickles on the edges of the banner and in the centres of the flowers to give it some sparkle and shine. 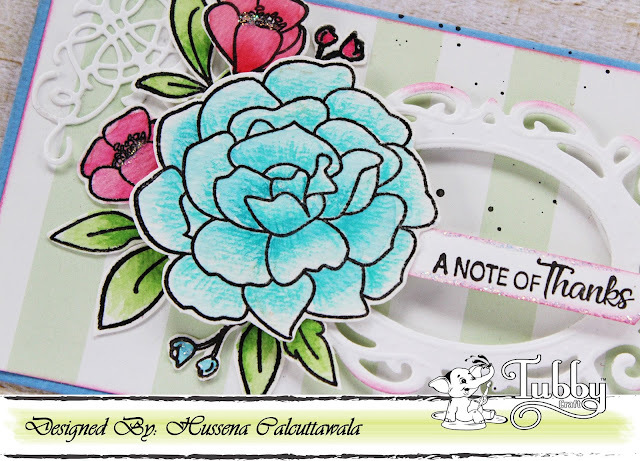 The flowers were heat embossed on Strathmore Watercolor paper, and Tubby Craft inks blend beautifully on this paper. You can see the embossed lines clearly in the picture below. I also added few berries to my foliage to complete my floral arrangement. For this one, I again used the same sets - Buttercup and Floral Peony. I stamped, heat embossed, and coloured my images and then fussy cut them. These two sets really go along well with each other, and can be combined to create a variety of clusters. 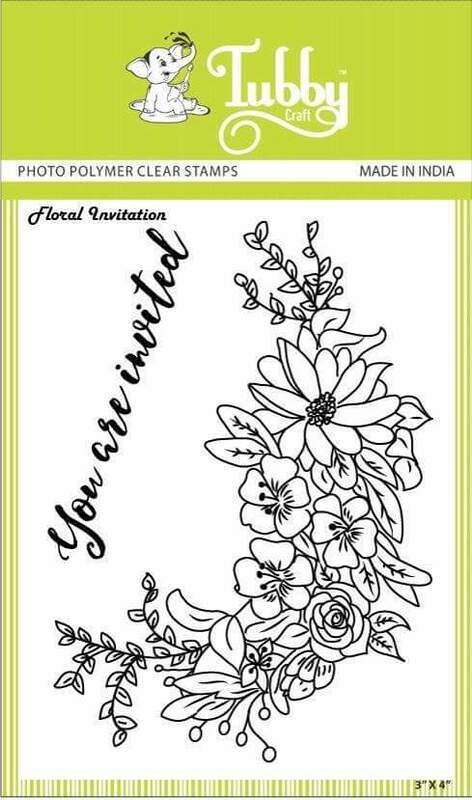 I used the Imperial Red, Hot Pink and Light Pink inks for coloring the red flowers, and Lawn Green ink for the leaves. 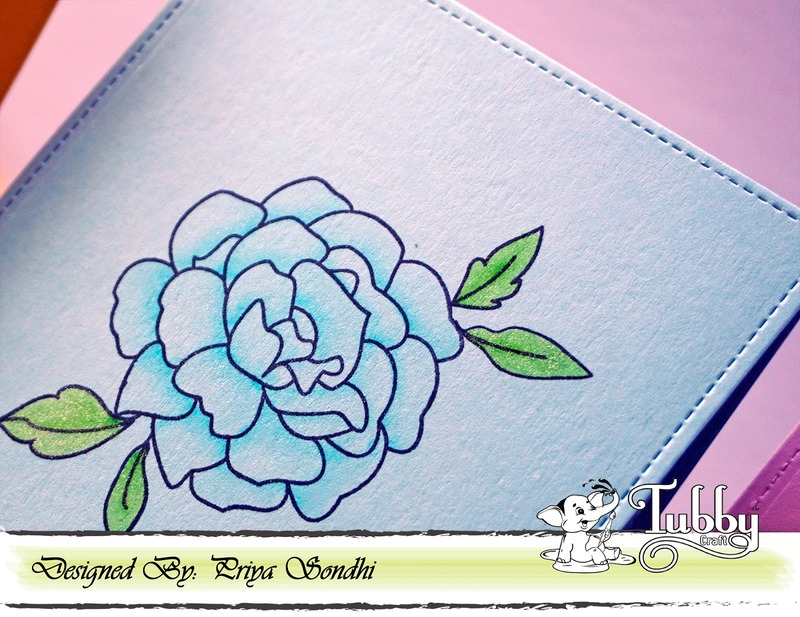 The blue flowers were coloured using the Aqua Blue ink. 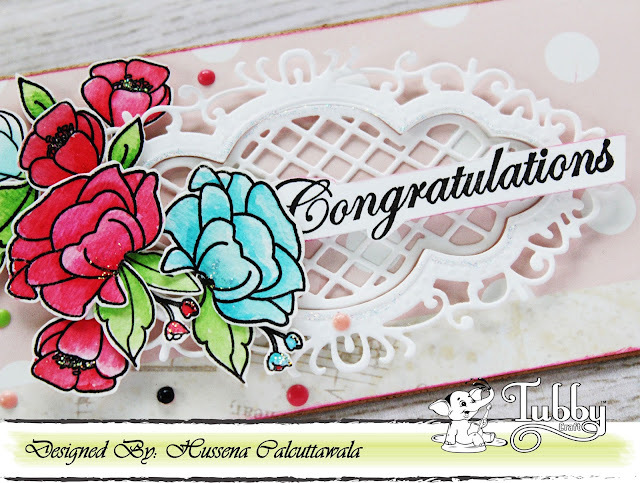 To finish off my envelope, I stamped a sentiment from the Fancy Sentiments set and fussy cut it so that it would fit onto the lace-y die-cut in the background. 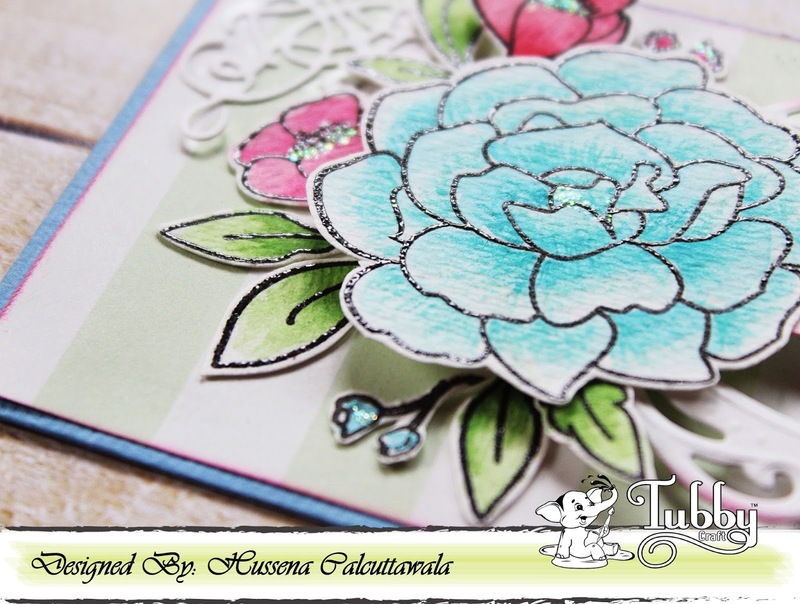 I added few enamel dots and Diamond Stickles on the flowers to complete the look. 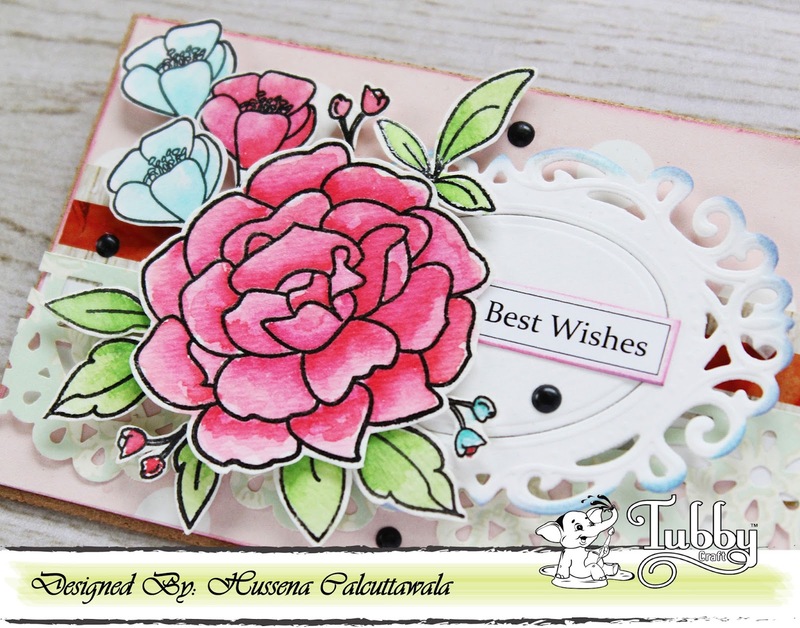 I repeated the same process that I did for the second envelope - I stamped, heat embossed, coloured and fussy cut the peony and the smaller flowers from the Floral Peony and Buttercup sets respectively. I just changed the die cut and the sentiment this time. The peony flower was watercoloured using a mix of Imperial Red, Hot Pink, and Light Pink inks, while the leaves were coloured using the Lawn Green ink. The small blue flowers on the extreme left were coloured using the Aqua Blue ink. I distressed the sentiment banner using the Light Pink ink. 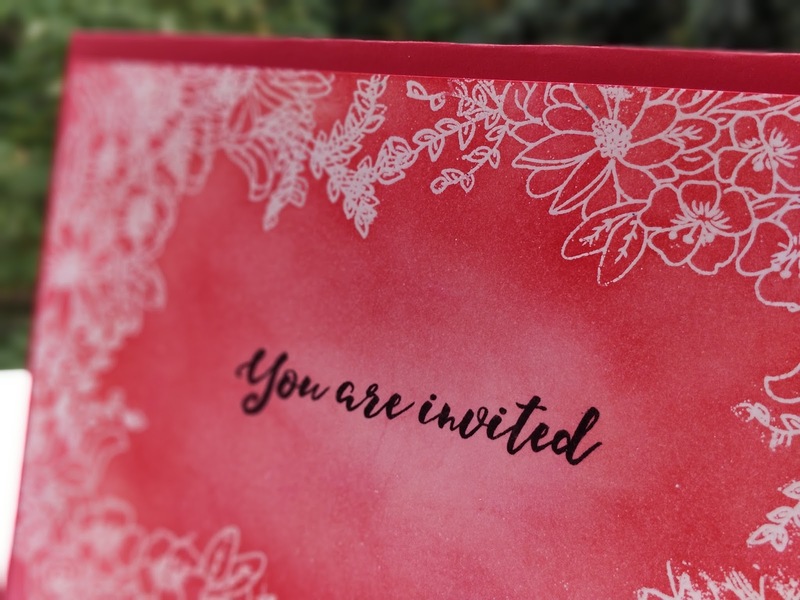 I also added few black enamel dots to pull in everything together and my envelope was done! Finally the last envelope for today! Phew! I hope I haven't bored you. :P I tried to keep this one very simple with minimum embellishments. I love how the inks look when they are watercolored. They are so vibrant and are excellent for watercoloring, distressing, ink blending, and stamping. I combined the Floral Peony and Buttercup sets for this one as well. I added few leaves coloured using the Lawn Green ink and some sprigs cut from Gold Mirror cardstock to complete my envelope. Here are the supplies I used for my today's post. I hope you like my envelopes. If you have any queries/questions regarding any of the supplies or techniques used, please feel free to leave a comment below. I will try to get back to you as soon as possible. 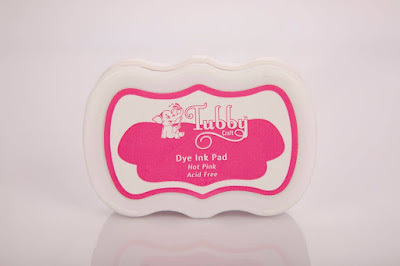 I have taken a pink colored cardstock and have drawn pink strips with a water color marker. 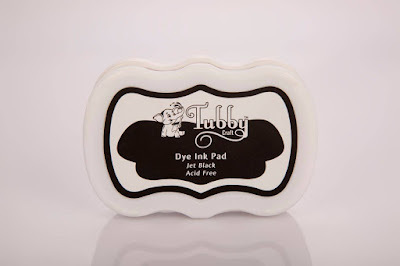 I have stamped the image from Butterfly love with Jet black dye ink pad from Tubby craft. I have colored the butterfly with Zig markers and adhered it to the cardstock. The sentiment is from the same sentiment stamped with Jet Black dye ink. I have finished the card with few enamel dots. Firstly, I have made the background with distress oxide inks. 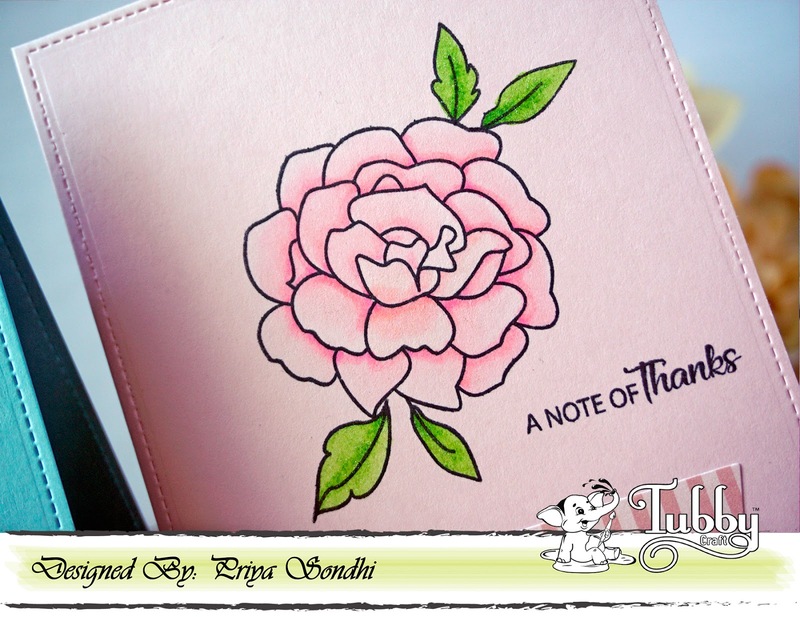 I have stamped and white embossed the image from Floral Peony, colored it with zigs. I have fussy cut them and adhered them to the cardstock. 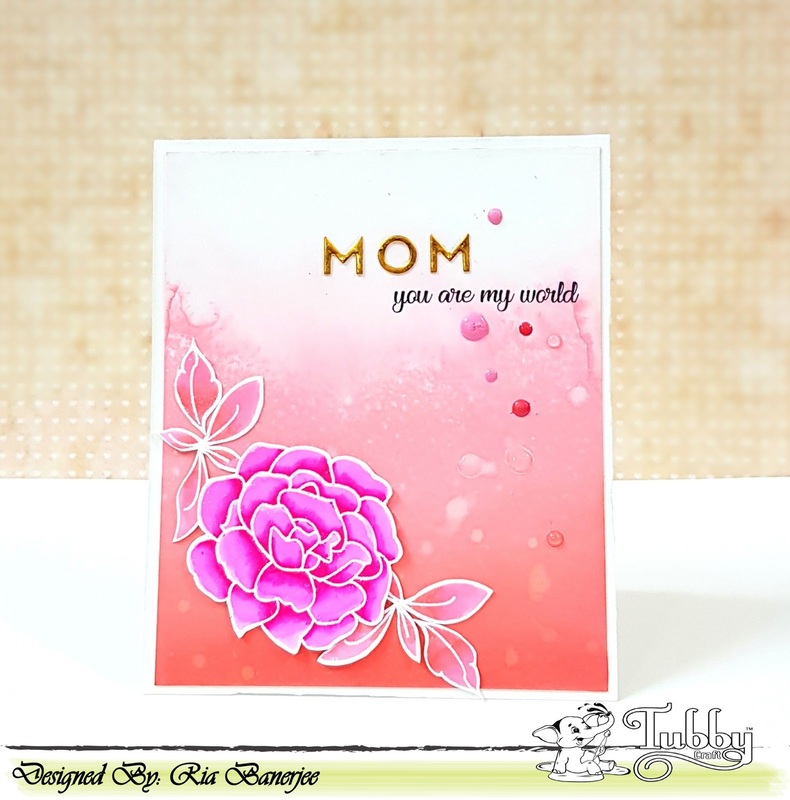 I have stamped the sentiment from the same set with Tubby craft Jet Black dye ink and coupled it with MOM diecut. I have finished the card with enamel dots and nuvo drops. I hope you have liked the projects. We can't wait to see what you create with these amazing products. This is Priya again bringing you a fresh set of cards using beautiful "Floral Peony" stamp set from Tubby Craft. This time I have tried monochromatic coloring on colored cardstock and made 3 cards using different color cardstock but kept the design same. Believe me, picture are just not able to do full justice to the beauty of these cards. These looks so whimsical in real life. 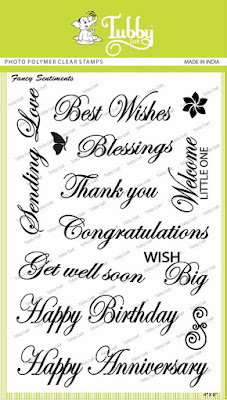 I am planning to make more cards of different colors of cardstocks. To make these cards, I arranged the Floral Peony stamp on my Misti and stamped onto different color cardstock to make a set. After that I used my zig markers to color the flowers. I tried to give it a soft monochromatic look by using base color as my main color for coloring. To raise a image further, I blended the zig markers with Wink of Stella Clear Glitter pen. Here is a close up of the sparkly shine I got using wink of stella glitter pen. Here are some close ups of color blending on blue and pink card stock as well. 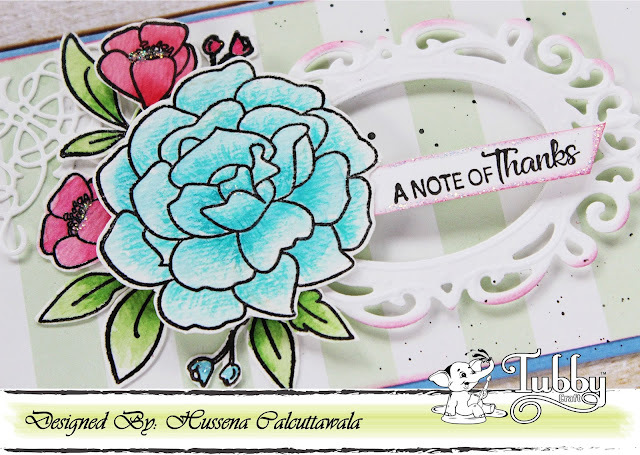 I hope you liked my new experiment today on coloring over colored cardstock. 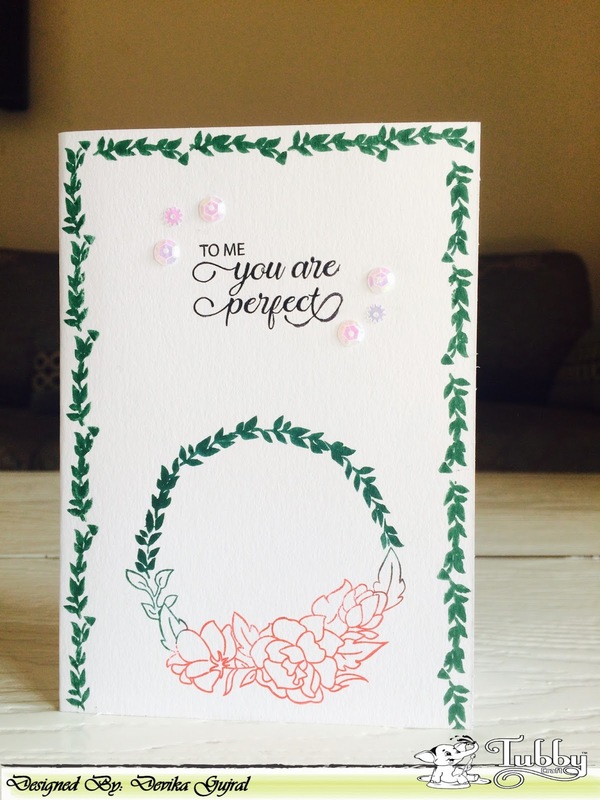 I kept the design simple as I really wanted to highlight the sparkly coloring over colored cardstock. I will see you guys next week with another set of inspirations. Ria on this side from Criar. 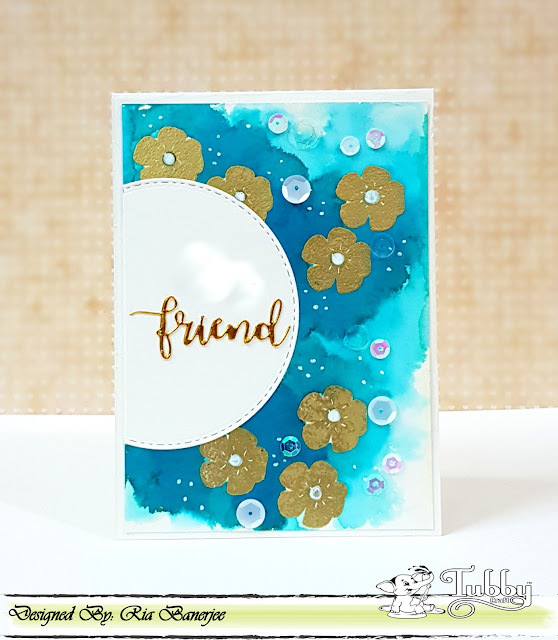 Today I have used a single stamp set to make two cards quickly. 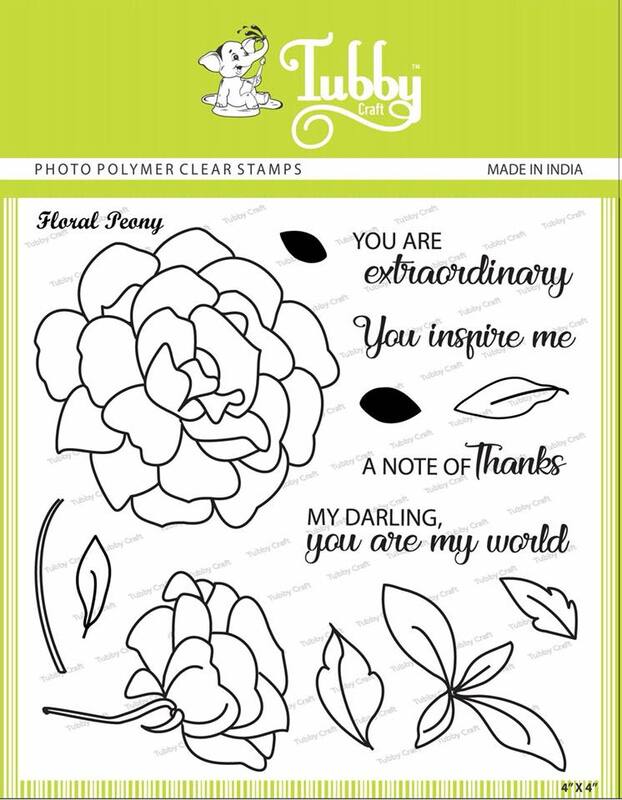 I have used the Butter cup stamp set. Here, I have used the solid images of flowers. 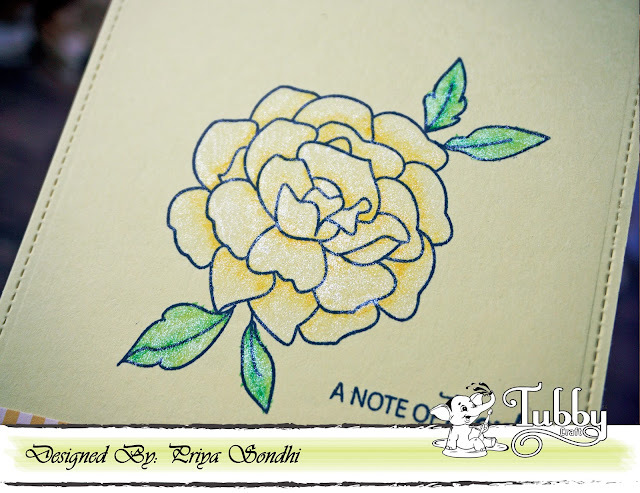 I have stamped them with Versamark ink and embossed them with gold. I have used the distress refills to water color the background. I have completed the card with nuvo drops, sequins, a die cur and some white gel pen. I have blended distress oxide inks on a white cardstock and blended a darker color through a stencil. 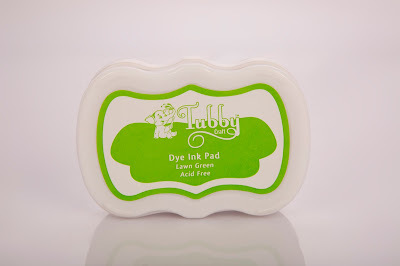 Then I have taken Tubby craft chocolate brown dye ink pad to stamp all the solid images from the Butter cup stamp set. I have added some details with white gel pen. 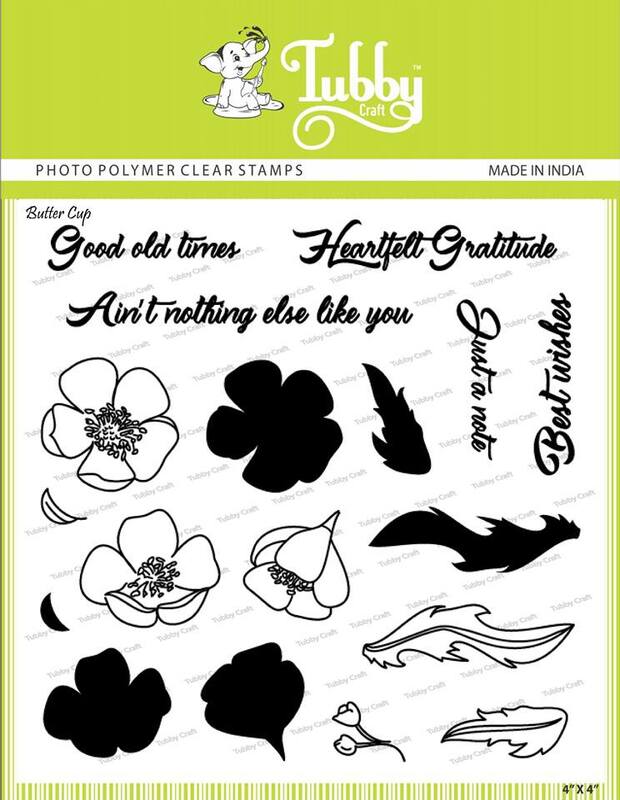 the sentiment is from the same stamp set which is stamped with Tubby craft Jet black dye ink. I have coupled the sentiment with a die cut. 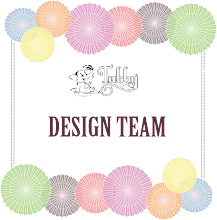 Share your projects with Tubby Craft supplies with us. 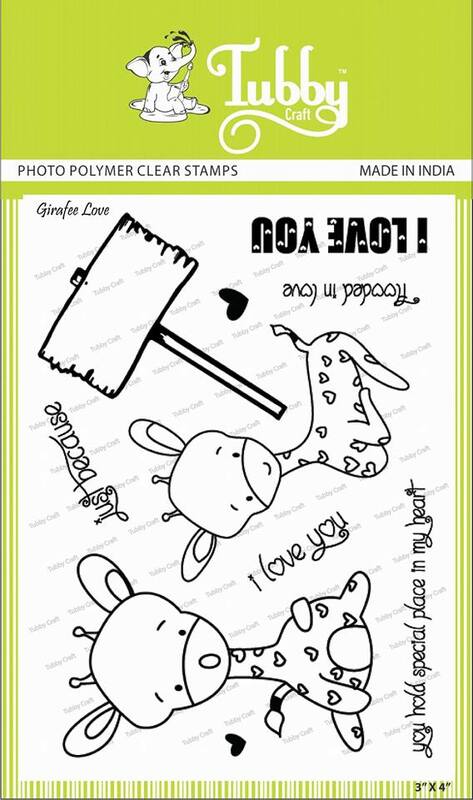 Guest Design Post by Piyu : Giraffe Love again! 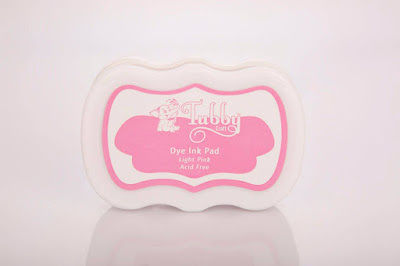 This is Piyu again and I am back with my second guest Post here. 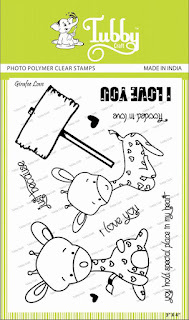 Today, I have a CAS card and a co-ordinating tag made with the same adorable stamp set - giraffe love. I first stamped the giraffe and colored it using copic markers. Then I added the 2 hearts and sentiment. The hearts are stamped with Tubby craft's Imperial red ink. 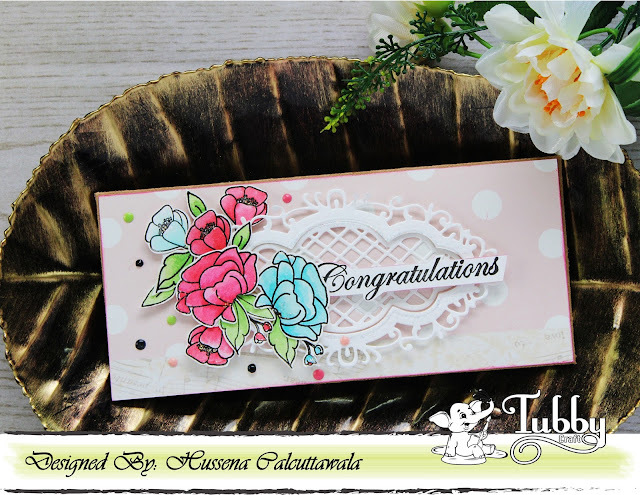 Finally I stamped the sentiment made using 2 stamps. 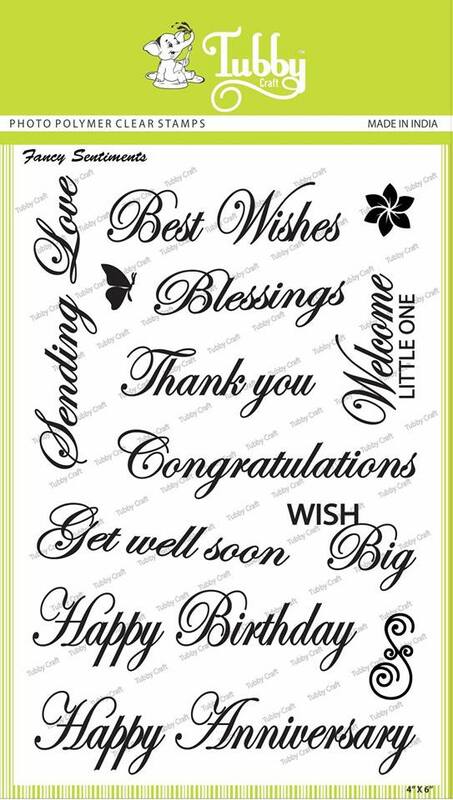 I loved the crisp stamping of the intricate sentiment. I also added some highlights with white gel pen. Hope you liked my creations today. Thank you for stopping by. 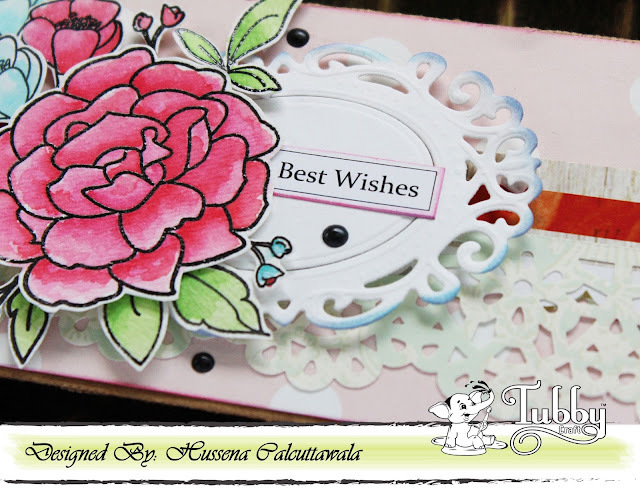 Devika here and I have 2 pretty cards today to share. 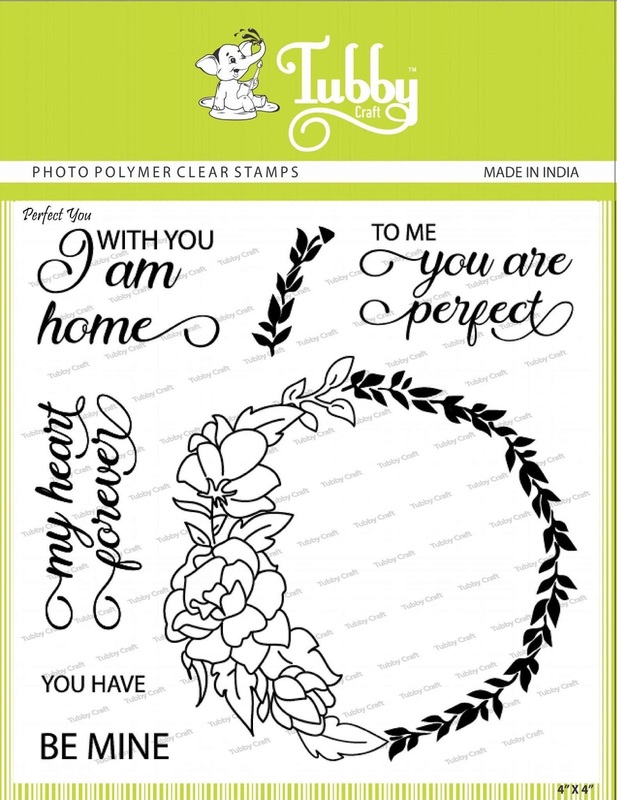 This is a simple card and I live this stamp set because this alone can create a complete card. 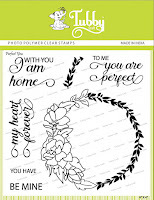 Take the leaf stamp and stamp it on 3 sides of white cardstock with green ink. Now stamp the leaf part of the wreath with green ink and the floral part with red ink. Stamp the sentiments with Tubby craft ink pad: Jet black. Hop on to the video for the complete, detailed tutorial. Please do subscribe to my channel for more crafty videos! Hope you guys enjoyed today's blog! See you next week with more craft inspirations.